Six historical Christmas romances prove life's most priceless gifts come not in the form of polished gold or silver but from the vast riches of a loving heart. 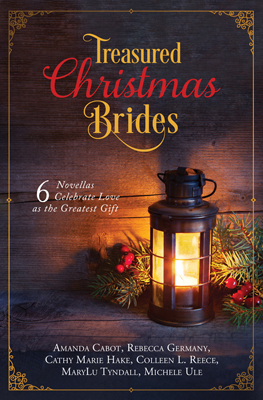 I'm delighted to have my story, The Christmas Star Bride, included in this heart-warming collection of novellas celebrating the joy of love at the most wonderful time of the year. You may have already read The Christmas Star Bride, because it was originally published a few years ago and is still available as an ebook short. But in case this is your introduction to it, here's a bit of information about The Christmas Star Bride. Esther Hathaway lost her one true love at Gettysburg twenty years ago, but that doesn't stop her from celebrating her niece's wedding by commissioning Jeremy Snyder to paint her portrait. Will Esther's prayers for God to ease her loneliness be answered by a wounded vet? The Christmas Star Bride was the first of my novellas set in Cheyenne, but it's not the last. The Fourth of July Bride, which is part of The 12 Brides of Summer, continues the story of Esther's bakery. The Rails to Love Romance Collection includes my story, The Depot Bride, and The Matchmaker Bride Collection has the final Esther's bakery story, The Unmatched Bride. I hope you'll enjoy them all. The Christmas Star Bride is also available for download as an ebook short for only 99 cents.